If your ideal holiday is fishing, walking, cycling, horse riding or playing golf then you will have too much to choose from. If you are interested in history, poetry, lace making, music and art there are many hours of entertainment in store. A fisherman’s paradise with a multitude of lakes and rivers. 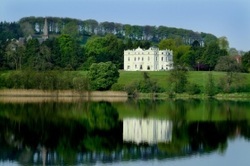 Characterised by a natural drumlin landscape, Monaghan provides easy access to quality fishing, sight-seeing and lively night-time entertainment. The county is proud to be home to one of Europe’s premier coarse angling venues, Castleblaney sits on the shores of Lough Muckno. Carrickmacross is the centre of a network of premier coarse angling waters which produce excellent catches annually. The county town Monaghan has several well known coarse fishing spots in the area catering for the novice through to expert angler. Stuated on a hill-top beside the border in North West Monaghan, Clones is surrounded by up to sixty lakes within a five mile radius. It is part of the Erne catchment which is potentially one of the greatest fisheries of Europe. Ballybay is a market town located on the shores of Lough Major. It is a haven for the coarse angler with the challenging Dromore river system right on it's door-step.